AirPlay Mirroring arrived on the Mac with OS X Mountain Lion, but Macs built before 2011 don’t support the feature, and obviously any OS X version prior to 10.8 won’t have it either. That is, until you run AirParrot, which enables AirPlay Mirroring on any Mac (or Windows PC) running OS X 10.6.8 or later. 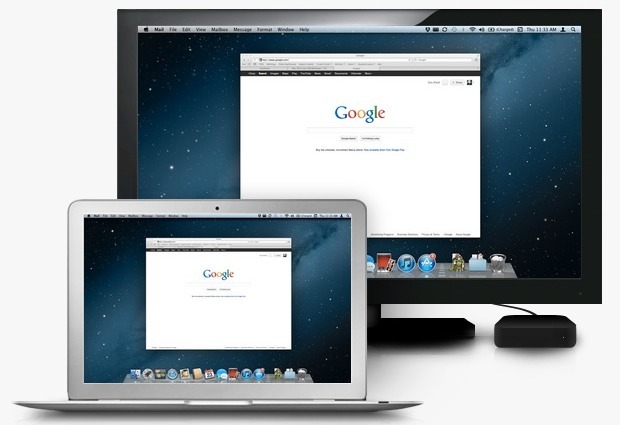 To mirror your Mac or PC screen you’ll obviously need an Apple TV to send the display to, or a software-based AirPlay Server like Reflection running on another device. Then all you need to do is launch AirParrot, pull down the menu, and select the output device to mirror the screen to. In a second or two, you’ll have perfect display mirroring. It really is that simple to use, and considering AirParrot supports such a wide variety of hardware and older OS versions including Snow Leopard and Windows XP, it makes you wonder why Apple just didn’t bundle the feature on more Macs to begin with. AirParrot has a free trial mode that works for 20 minutes before terminating the AirPlay session, giving you more than enough time to try it out. Unlocking unlimited usage costs $10. If you’re bummed your Mac didn’t make the official AirPlay cut, AirParrot is a no brainer to at least try out. There really isn’t any other worthwhile option to enable AirPlay on older Macs, and that it runs on Windows too is a nice bonus for PC-based gamers too. Works very well on a 2010 MBP here. Great app! It only goes to show that Apple forcefully disables functionality for older hardware, as so you have to buy new(er) products. Don’t get me wrong, I love Apple products, hardware and software, but it’s a shame we (I) have to discard of somewhat older Apple products, because they are left in the dark. The whole Apple ecosystem could even be bigger, if people were allowed to use older (is a 2008 Macbook really that old for 10.8…?). I disagree. If you see your older Mac max out while attempting mirroring you would understand why Apple didn’t implement it on Macs with unsupported GPU’s. You say you love Apple products, well you would hate your mirroring experience on an older Mac, believe me. Nobody should expect Apple to support, retrospectively, new technology that wasn’t intended for old hardware. How far back do your expect Apple to retro support old Macs? Power PC’s? The Apple Lisa? My MBP is a 13.3 from middle 2010 with a Nvidia GeForce 320M! That should have enough power for that feature! I agree with Misha! It’s a shame! With Airparrot I can use 3! displays on my MBP! One is the internal, second is a 22″(with display port) and 3 is a 42″ full hd tv! You can see it has power enough. VLC Streamer works very well, with my iPad as the go-between. It’s free, too. You install VLC Streamer on the iPad and its Helper App on the iMac, and you’re all set. The reason why Apple didn’t include it on older Macs is because of GPU power. Mirroring max’s out the GPU, turning your Mac into a toaster. My Macbook Pro 2009 runs at 90-100% on both cores while using Airparrot. Your GPU has to encode any video to mp4, on the fly, then stream it to your ATV. Also you need to kick all other users off your network to have it run smoothly. Freezing and chopping is constant. MacMini owner desktop user here, but also I use a Samsung Series 3 “Macbook Air knock-off” ultrabook running Win 7. AirParrot is not perfect, but I would certainly give it at least a A- with getting my Sammie to work with Apple TV and mirroring Powerpoint presentations and slideshows. I haven’t tried any video yet with it though. It’s worth $10 for sure though whether your are a Win user or older Mac user.